The "mostly sunny" weather continues. 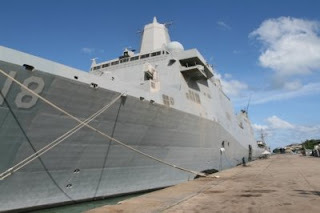 Today has been sunny and warm, light winds, perfect weather for diving, exploring Phuket, or visiting US Navy ships! My 4 year old son had a school field trip today to see the USS New Orleans, one of 5 navy ships that stopped at Phuket this weekend bringing a boost to tourism for sure.. some kinds of tourism more than others. If you own a bar and did not make a profit this weekend, time to find a new job! Now, there has been some cloud and light rain in the last 2 days, but I mean, the rain was very light and lasted a few minutes. Mostly very sunny, which is not quite the norm at this time of year. You would expect a bit more rain in Phuket. I was at the Bang Wad reservoir yesterday evening and it is starting to look a bit low. In fact, I discovered today a website that I had not seen before, a Global Drought Monitor which is part of the University College London climate extremes site that also does the excellent Tropical Storm Risk website which I link to on the left side of this blog. Drought in Phuket? Are you having a laugh? Well, sure we are not in a desert, I can turn on the tap and get water for my shower, BUT I found it very interesting to find from the Global Drought Monitor by zooming in to Thailand on the map.. Phuket is having a "Minor Drought". Sure, we locals could have told you that, but nice to be backed up by climatologists! Zooming in further... looks like my wife's family home (Chumphon, on the east coast) is having a "Severe Drought"! Well, for sure the family says it's hot, not much rain. Forecast? Well, the one I trust most is Wind Guru. Maybe not perfect on rainfall and temperature, but great for wind and waves.. and at this time of year strong winds means rain and storms... so that means the next week in Phuket looks pretty nice. Here's a pic of Patong on 28th June. One of those little bands of rain comes in fast across the sea. Sunbathers, time to run for cover! But the rain will last just a few minutes. OH! There is meant to be a beach clean up on July 2nd (Thursday), all beaches, everyone welcome. I will be at Karon Beach, the clean up starts outside the Hilton 10am. Or at any beach. Look for people with bin bags!